You are here: Home / Women's Issues / Gen Xer suffers brain fog. Tries HCF. Gets a happier brain. Likes it! Gen Xer suffers brain fog. Tries HCF. Gets a happier brain. Likes it! I recently received a bottle of the brain supplement Happy • Calm • Focused or HCF. Like most Gen-Xers who’ve been inundated over the last 25 years with a nauseating cocktail of marketing hype and scare journalism, I’m skeptical about, well, everything. It’s all those product recalls. There’s been so many over the years, I’ve grown numb to them. All that to say, the pretty cobalt blue bottle of Happy • Calm • Focused stayed on the shelf for a few weeks until I finally tried it. I’m so glad I did! It really seemed to make a difference. I slept better. I had more energy, less brain fog and my focus was better. My father suffered with Pick’s Disease, a rare neurodegenerative disease that causes progressive destruction of nerve cells in the brain. Witnessing his deterioration — 12 long years in a godforsaken nursing home — was devastating. While nobody is claiming HCF will prevent such horrible things (my dad was exposed to atomic bomb tests in Marshall Islands), I do believe the supplement, which is fueled by amino acids and 15 (15!) neuro-nutrients can make a difference in a person’s quality of life. It has definitely helped me sleep better and think more clearly. 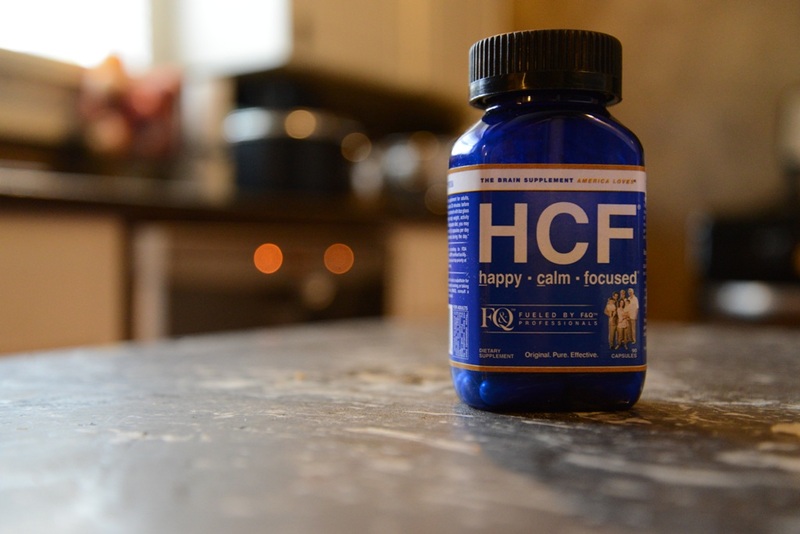 What makes HCF different than other brain supplements is a formula that includes two key amino acids – F and Q. You can click here to read more about them. Basically, the F can increase feelings of love, pleasure, happiness and energy, etc., while the Q can tone down “mind chatter” and help you concentrate. As with anything there are important disclaimers, so check them out, too. HCF is hypoallergenic and contains the purest neuro-nutrients obtainable: no preservatives, no chemicals, no coatings, no calories, no sweeteners, no enhancers, no yeast, no fragrance, no dairy, no gluten, no nuts, no wheat. Do you ever suffer brain fog? Have you tried HCF? For a great review, visit the peppy Perimenopause blog. This blog maintains compliance with FTC policies regarding product reviews by bloggers. Click here to read my disclosure.